Get to know the man behind the curly mustache! 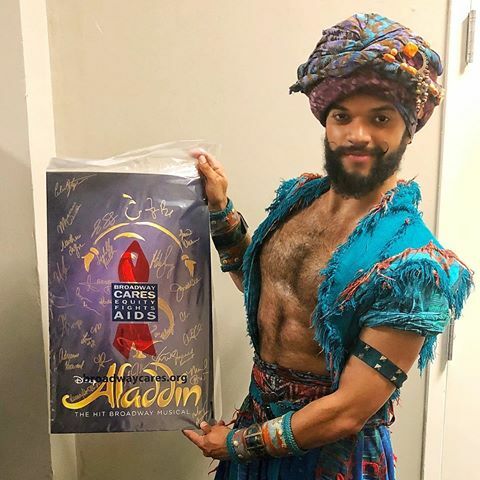 We talk to Albert Jennings from Disney’s Aladdin national tour. My family used to take me to the local touring house, PPAC. I would be so excited! Since then I was hooked on the singing and dancing. I enjoyed the way I felt after the experience. Now I get to be the one to change people’s hearts, feelings, and minds through performance. I love that. I usually arrive at the theatre 30 minutes before half hour because we have a fight call at 15 minutes before half hour. In that time, I say hi to people in the theatre, get a cup of coffee, and apply my makeup - the Infamous Curly Mustache! It’s a staple for me. Then after fight call, I take the remaining half hour until curtain warming up and preparing for the show; vocalizing, core workouts, push-ups, etc. Then it’s show time! Besides being in the ensemble you also understudy for Kassim and Omar, how do you balance both parts? I do, I do! It’s great that these two characters, who are Aladdin’s friends interact with each other. Makes it’s easier to remember lines and choreography since they are a tight unit and bounce off each other. Usually when I’m backstage I listen to their scenes and watch them on our show monitors. Also, we do usually have understudy rehearsals weekly. Making sure to always be prepared at a moment’s notice. What I love about this ensemble specifically is that we are all a “rainbow” of amazing actors with varied backgrounds here telling a story! What I enjoy about being an ensemble is the extension of the main story we help tell with the singing, choreography, and acting. Favorite moment of touring is that we get to bring theatre to people who may not be able to go to New York City. We get to bring Broadway and the experience to them! Oooh, that’s a tough one been to so many great cities. Thus far one of my favorite cities is Seattle! It actually was my third time there and I always find something new. It reminds me of my home honestly. It’s by the water, great views, awesome seafood, great art. But I’m looking forward to going to New Orleans again in the fall! Wish, funny you use that word! I think it’d be cool if audience members could see how much team work is actually involved with being part of the ensemble. All the rehearsals, the time, the hard work; not from just the ensemble, but from the crew to management. To see how hard it is but how we make it so easy.